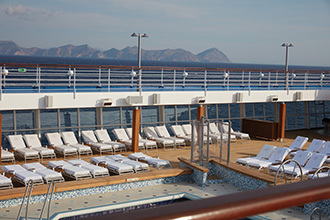 Luxurious cruising is offered on the all-suite, all-balcony 700-guest Seven Seas Voyager, with a delightful casual elegance. 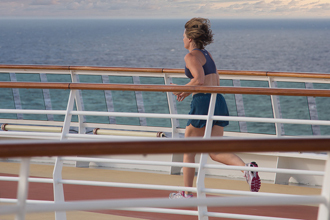 Experience a country club-like casual lifestyle on this mid-sized six-star ship, which, due to its size, has easy access to smaller ports of call larger vessels cannot visit. Boasting an incredible staff-to-guest ratio of 1 to 1.6, guests can be pampered with the highest level of unobtrusive personal service. 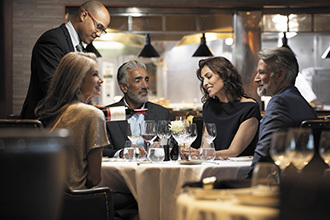 Savor incredible mouthwatering cuisine at four gourmet restaurants, pamper yourself at the world-famous Canyon Ranch Spa Club, watch Broadway-style shows, wine tastings, culinary demonstrations, virtuoso performances and lots of chic bars and lounges. 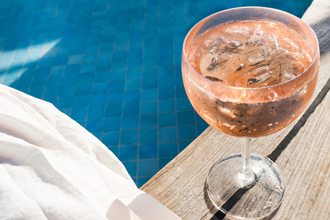 Join fellow guests for a cocktail or frozen drink as you relax at the Pool Bar, shop for duty-free items at the Boutiques, sip a fine cognac at a chic lounge, and enjoy Broadway-style shows at the state-of-the-theater. Throughout the day, enjoy coffee, snacks and lunch at the Coffee Connection and catch up on your reading or borrow a DVD for in-suite viewing. Delicious cuisine at no additional charge is offered as you dine whenever, wherever and with whomever you choose, including the finest imported French flour and wonderful artisan cheeses. Acclaimed chefs will create unforgettable culinary experiences. 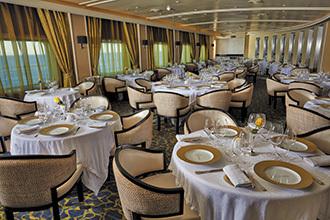 European-inspired Continental specialties, as well as excellent vegetarian and Canyon Ranch SpaClub selections are featured at the main dining room named Compass Rose. Contemporary interpretations of classic American steakhouse fare is offered at Prime 7 and decadent haute French cuisine is beautifully presented at Signatures. Evenings, the casual Sette Mari at La Veranda boasts a fabulous menu of authentic Italian specialties, paired with fabulous Tuscan wines. Buffets featuring breakfast and lunch serve regional specialties and classic favorites, as well as authentic pizza for dining al fresco. 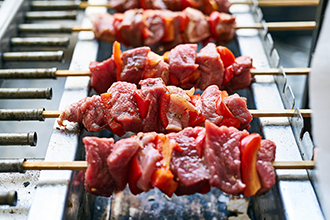 Poolside, the come-as-you-are Pool Grill features great snacks between activities as well as grilled fare, sandwiches and salads. 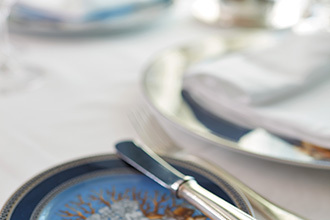 Convenient room service is offered 24/7 and during dining hours, you can be served course-by-course from the Compass Rose menu. Providing a serene haven, accommodations are all-suite and all-balcony, with relaxing color schemes, for a comfortable spacious home away from home. Beautiful bathrooms are adorned with marble appointments. Enjoy interactive flat-screen TV with an extensive media library and complimentary movies-on-demand. Guests in Penthouse Suites and higher also enjoy Butler service. Enjoy excellent entertainment at the two-tiered Constellation Theater, with comfort offers plush seating where you can see an extensive variety of exciting choices. Enjoy Cirque-style performances, full-scale Broadway musical revues and fabulous cabaret shows; all accompanied by the nine-piece Regent Signature Orchestra. 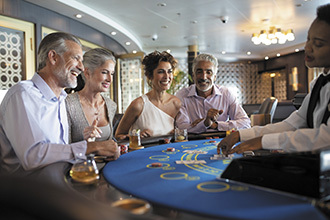 Try your luck at the stunning Casino, boasting a variety of games, including blackjack and roulette. 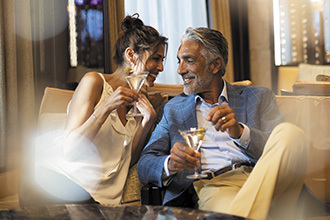 Stylish and elegant, yet laid-back, chic lounges provide the ideal venue to relax and enjoy friendly conversation with fellow travelers as you sip a fine cognac. Smoke an imported cigar from the humidor in the plush and secluded Connoisseur Club and mingle over cocktails in the delightful piano bar. 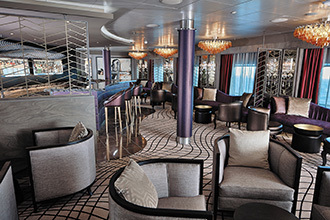 Samba across the dance floor and later, head to the stunning Observation Lounge for a quiet nightcap. 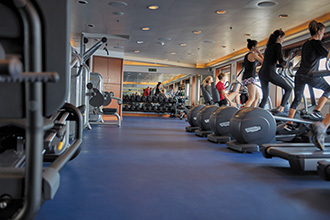 From disco dancing and karaoke to the three-piece jazz combo, there incredible entertainment options are also offered on the spectacular Seven Seas Voyager. 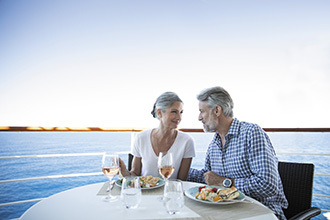 Cruise in elegance on the Seven Seas Voyager to worldwide destinations, including the Mediterranean, Southeast Asia, China, Australia/New Zealand, and other World & Exotic cruises. 1 Marble Bathroom, Intimate Sitting Area, Private Balcony, Walk-in Closet With Safe, Accommodates Up To 3 Guests. 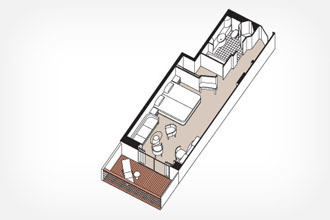 Suite: 320 sq.ft.,Balcony: 50 sqft. 1 Marble Bathroom, Intimate Sitting Area, Private Balcony, Walk-in Closet With Safe, Accommodates Up To 3 Guests. 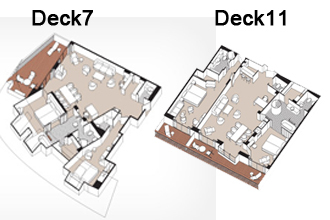 Suite: 306 sq.ft.,Balcony: 80-137 sqft. 1 Marble Bathroom, Intimate Sitting Area, Private Balcony, Walk-in Closet With Safe, Accommodates Up To 3 Guests. 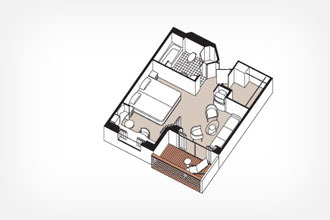 Suite: 306 sq.ft.,Balcony: 50 sqft. 1 1/2 Marble Bathrooms, Spacious Living Room, Private Balcony, Walk-in Closet With Safe, Accommodates Up To 4 Guests. 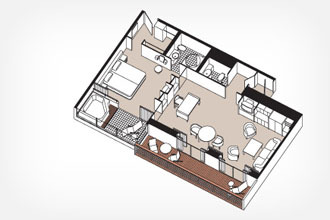 Suite: 753 sq.ft., Balcony: 123 sq.ft. 2 1/2 Marble Bathrooms, Spacious Living Room, 2 Private Balconies, Walk-in Closet With Safe, Accommodates Up To 6 Guests. 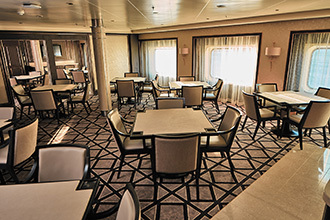 On deck 7, suite is 1,152 and On Deck 11 suite is 1,216 sq.ft. AFT- 1 Marble Bathrooms, Living Room, Private Balcony, Walk-in Closet With Safe, Accommodates Up To 3 Guests. 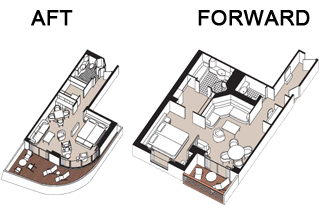 Suite: 392 to 492 sq.ft., Balcony: 172 to 283 sq.ft. FORWARD- 1 Spacious Bedroom With European King-Sized Suite Slumber Bed®, 1 1/2 Marble Bathrooms, Spacious Living Area, Private Balcony, Walk-in Closet With Safe, Accommodates Up To 3 Guests. 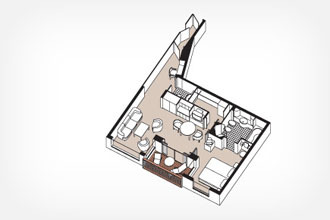 Suite: 495 sq.ft., Balcony: 50 sq.ft. 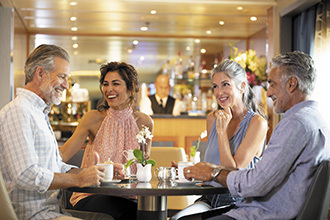 Coffee Connection is your informal destination to relax, meet other Guests and enjoy coffee and snacks throughout the day. In addition to coffee selections, food is available. 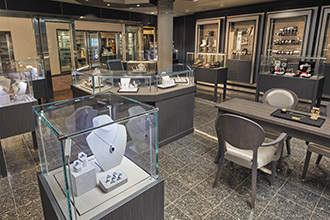 Additionally, international newspapers and news magazines will be placed and displayed in the Coffee Connection whenever available. La Veranda offers regional specialties that often reflect the cuisines of the countries called on, such as Grilled Lamb Chops with Spanish Sherry Sauce or pan-sautéed Mediterranean Sea Bass. Dishes are presented in a buffet style that displays the diversity of the menu. La Veranda also features an authentic pizzeria and a shaded, open-air veranda for dining al fresco. 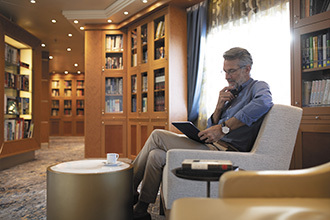 The Observation Lounge is a quiet place to read and relax while watching the spectacular views Seven Seas Voyager offers upon entering or leaving the various ports of call. 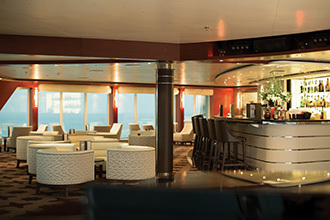 The Voyager Lounge and nightclub is the perfect venue to meet friends and fellow travelers for a pre-dinner cocktail. After dinner, the Voyager Lounge turns into a nightclub and is the place for those night owls wanting to dance into the night or maybe sing along in a karaoke competition. Musicians will entertain nightly, and during the late hours on selected nights a DJ will be there to play a variety of recorded music for your listening or dancing pleasure.